There is a reason why text tees have been embraced by so many women worldwide. One of the reasons is because these tees allow you to show your character by the choice of cheeky slogan that’s emblazoned across your shirt. Fashion is continuously inspired from the past and the nineties have served as inspiration time and again. Alexander Wang recently explained why he loves to use logos in his designs, and commented on the nineties saying, “Fashion was really fun, when there was wit and humor, and it wasn’t so serious.” And I cannot agree more! Sometimes fashion needs to be fun! The slogan tee is a chance for women of all ages to proclaim whatever slogan they can get their hands on, and happen to look edgy and stylish at the same time- so it may be a little infantile at times, but mix these tees with geometric patterns, bold prints, asymmetrical skirts or simple leggings and you’ll look wonderful! Looking to the East for inspiration has produced some very elegant and refined looks. Japan has heavily influenced western fashion in recent years and the result has been inspiring. Rich embroidered patterns and exotic colours have been introduced into our otherwise neutral wardrobes, high-neck collars, kimono styled jackets, full satin blossom skirts, and cheongsam-style dresses with flattering streamlined shapes. We drew inspiration from Kenzo and Miuccia Prada with their use of bold tiger prints and Proenza Schouler’s Chinese-embroidered bomber jacket, but there is something alluring about the oriental prints from the bright floral prints to the more modest chinaware print. On the streets this trend has transitioned to make it more wearable and less daunting for everyday looks. 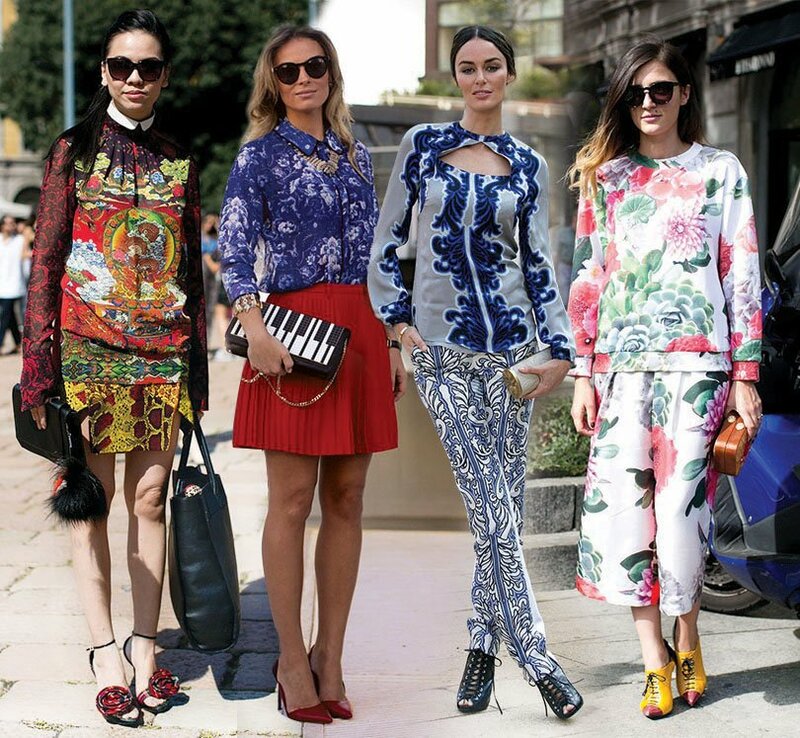 Fashion enthusiasts have combined oriental inspired prints with an element of androgyny, such as a flowing floral pantsuit. Floral blossom skirts are paired with neutral hues, clashing patterns are worn with high-neck collared designs and embroidery is at its finest with bomber jackets that show oriental detailing yet remain casual and easy to wear. Capes and Kimonos have been adapted from Japanese clothing and are cool and feminine, while more subtle looks are introduced with just a simple belt, shoe or handbag. While this trend may be for the bold, there is a definite historical element surfacing and we all love our fashion history. Not to mention that the air of resplendence is hard to ignore! 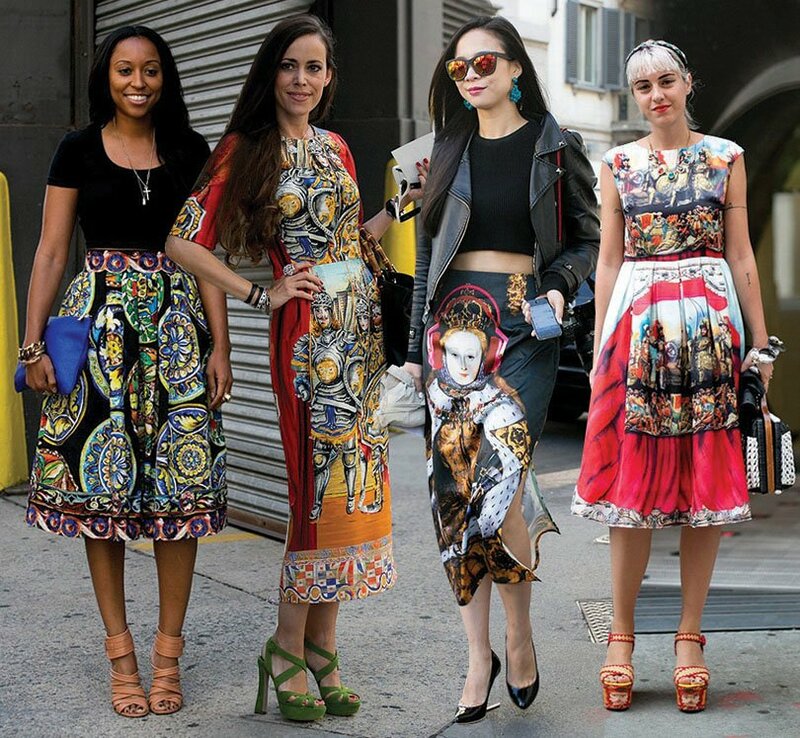 You can draw inspiration from the designs and decadent fabrics of Dolce & Gabbana, Valentino and Balmain but the streets will teach you all you ever need to know about how to wear the Emperor and Byzantine art prints. The key with this look is to embrace the rich regal hues. This is the time when your wardrobe can have as much colour as you want, with the introduction of royal purple, bright yellow, burnt orange, forest green and burgundy hues. These tapestry inspired prints look chic when worn in caped sleeve dresses, high collar designs, high-waisted skirts and sweeping full length dresses. While these prints are incredible and will no doubt capture attention, if you are after a more modest look to the trend you can simply tone down the prints by pairing them with neutral shades. Remember detail is key to looking like a Queen!